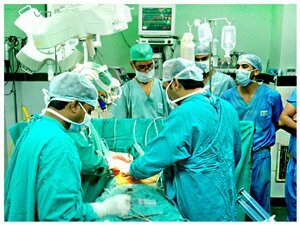 The Department of Cardiac Surgery at Heart and General Hospital, Jaipur, is one of the oldest but modern cardiac surgical units in the state. It has now matured into the best equipped unit run by an aggressive and extremely skilled team of doctors. The unit is equipped to handle all possible high risk patients for cardiac and vascular surgery. Internationally trained and young cardiac surgeons and anesthesiologists are able to provide excellent results. 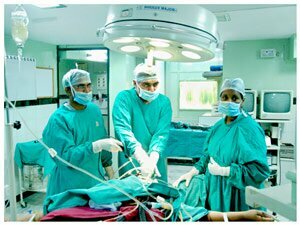 Our cardiac operating room boasts of top of the line 8 channel Marquette cardiac monitors, Saarns heart lung machine, Datascope Intra-Aortic balloon pumps, Siemens ventilators, Physiocontrol defibrillators, etc. 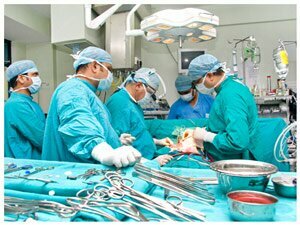 The unit has performed on an average three hundred fifty open heart procedures in a year. We have treated a number of high risk patients and produced internationally acceptable results. This number is an all time record for any private institution in the state. 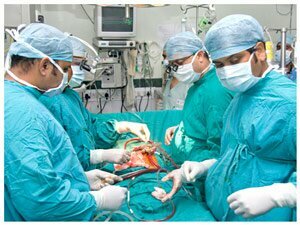 In addition to conventional cardiac surgery including CABG, valve replacement surgery and simple congenital defects the unit has endeavored to bring the cutting edge of technology to the city. We have performed a number of minimally invasive procedures using the innovative femoro-femoral bypass to provide cosmetic surgical scars for valve replacement and atrial septal defect closures. 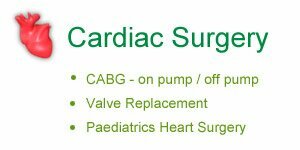 Most of our CABG are performed on beating heart and we have started endoscopic harvesting of conduits for performing minimally invasive CABG. We have also made significant progress in operating children with congenital heart defects especially cyanotic babies. This is the first time in the state that any private hospital has attempted to treat children with such serious cardiac disorders.